An electrical engineer who enjoys analogue music, tweaking Lp turntables and collecting watches. 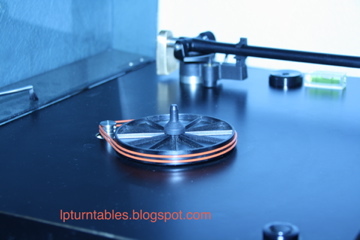 I am not affiliated, associated with any turntable manufacturers or their agents. If in the course of my work, certain company, brand, trademark or their products are mentioned or referred to, is considered nominative use, and does not in any way imply any relationship and/or endorsement with the corresponding trademark owners, their products or brands. 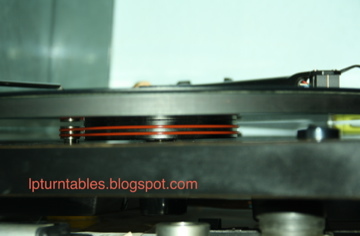 Have you ever thought of a "45/45 rpm" dual pulley for Rega? 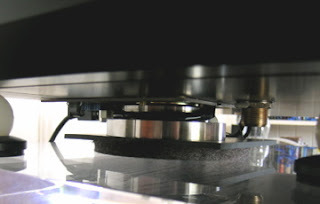 For a belt-drive turntable, the pulley may be just a small part, but it plays a crucial role in transferring energy from the motor to the platter and this directly affects the performance of the TT. Knowing this fact, many Rega TT owners have ungraded the stock plastic/aluminium pulley to either standard (33.3/45rpm) stainless steel pulley or dual (33.3/33.3rpm) pulley and enjoyed significant sonic improvement with the upgrade. Charles Hansen of USA, a university professor in music has a P25 TT with Music Hall Cruise Control 2.0 power supply. He was interested in this pulley upgrade. But 33.3/33.3rpm dual pulley was not compatible as Cruise Control required the belt to be parked at 45rpm(pulley groove). He had no choice but to go for the standard pulley first and requested for a 45/45rpm dual pulley specially for his Cruise Control. 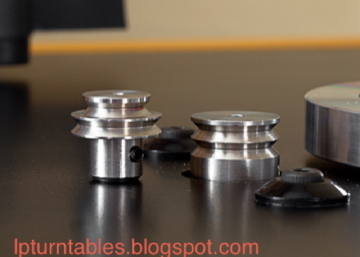 After trying out the 45/45rpm stainless steel pulley, what he has to say.....? He suggests all P25 owners to go for this option! The custom pulley and feet arrived safe and sound a couple of weeks ago and, just this past Saturday I had the time and quiet to install the whole bit. The pulley fit beautifully and I didn't have to adjust the motor spacers I had put in there previously to accommodate the first pulley you sent me. The new feet went on easily and, finally, I was able to install the two silicone belts you sent on the previous order. I probably should have installed the pulley and the double belts, gotten used to the sound and then, installed the feet but, I was not so patient! Tonight I am listening to Mozart piano sonatas and it is simply magnificent! My P25 is such a different animal than it was only a few weeks ago. The addition of your metal double pulley along with the Music Hall speed control really has solidified the imaging between my loudspeakers. I also feel as though I have gained almost an octave of bass response. Additionally, the timbal quality of the the instruments has somehow been enhanced in that I can hear the harmonics associated with the individual sounds as never before.The bass range of piano recordings is so much clearer, deeper and focused now. When listening to the Stravinsky Symphony in C, I was shocked by the double basses. For the first time, I heard the the harmonics within their sound – something I have NEVER heard before on what is a rather familiar recording. It's like they are really there and they don't get just "mushed" into the sound. For the first time in my years with the P25, instruments retain their individual qualities and location and have what I suspect is "air" around them. In my real life I am a university professor of music and a professional bassoonist playing over 60 concerts a year. I have played in orchestras for over 30 years and am very familiar with how instruments sound in real life.The upgrades to my P25 have brought me as close to that sound that I know as I've ever heard from my system. I would suggest that, for owners of the P25, using your double 45/45 rpm pulley in combination with the Music Hall Cruise Control 2.0 is really the way to go. Easy instalation and not so expensive. Years ago, I bought an Iorn Audio acrylic platter to replace the glass/felt combination on my P25. That was a probably a "minor" upgrade. A year or so ago, I bought a reference subplatter from GrooveTracer and a white Rega belt. That added a good measure of clarity to the sound. However, it wasn't until I added the Music Hall Cruise Control 2.0, your custom double pulley, aluminum feet and silicone belts to the mix that everything really came together for me. Just brilliant! My congratulations to you for such fantastic engineering and design work and the machining skill to bring these designs to life. I really appreciate your willingness to make that custom pulley for me. I'm so glad that I found out about your products! They have changed my analog life for sure. I will spend the coming months getting to know my 4,500+ collection of lps all over again. As you can see, your pulley and double silicone belts both fit beautifully with my GT Reference subplatter. 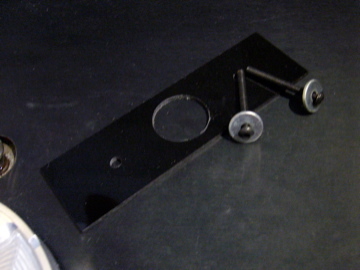 In the next photo, I've set your standard 33/45 rpm pulley next to the installed 45/45 rpm pulley for comparison. Here is a shot of the new aluminum feet. They look beautiful and, along with the other modifications, really enhance the sound. 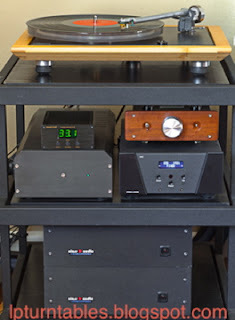 The next photo shows my system with the Music Hall Crusie Control 2.0 (little box with green numbers) sitting on top of my Progressive Engineering phono preamp. Also in the photo is my Wyred4Sound DAC2, Warpspeed LDR volume control and classDaudio SDS-450 monoblocks. 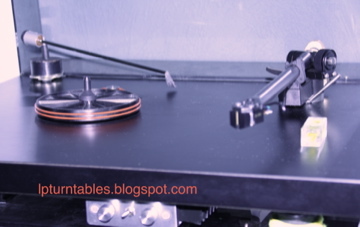 Below, is the setup I'm using to dial in the correct turntable speed. 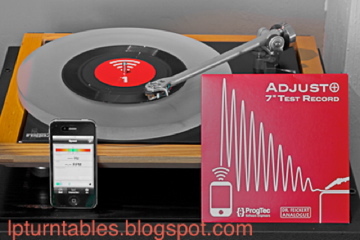 It's the Dr. Feickert system with the 7" test record and IPhone app to measure the 3.15kHz tone on the record. You just press the + or – buttons on the front of Music Hall Crusie Control 2.0 and the speed is shown on your phone. The only inexpensive way I was able to find that accounts for stylus drag when adjusting turtable speed. Totally easy to use and right on the money. 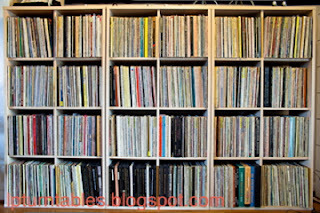 It's true, I have a lot of lps… This is a shot of half of my collection the other half is on a different set of shelves in another room. Maybe one day I can have them all in the same place. Again, thank you Michael for your terrific work and thoughtful engineering. An additional advantage of using the Cruise Control power supply is the speed of your TT can be fine tuned (not just selection of 33 or 45rpm only). Besides, as I have mentioned in my earlier post, when the belt is parked at 45(pulley groove)with this external power supply, the motor runs slower for 33 play-back, thus reducing motor noise and vibration. Significant sonic improvement can be expected. I would like to express my thanks to Charles for sharing his findings and thoughts with me! 1. The switching from 33 to 45 RPM by changing the belt from the small to the larger Part of the pulley is inconvenient and it changes the tension of the belt. 2. As it is well known the Rega TTs tend to a Rotation Speed thats too high. For this reason subplatters with an increased diameter are available. So in my understanding a fine pitch is needed. 3. The REGA TT PSU is too expensive and it consists of a quartz stabilized sine wave Output, but not of a pitch control. 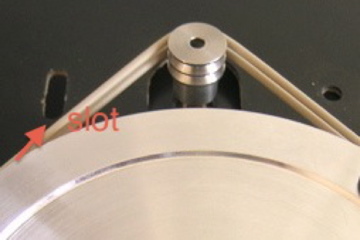 In my understanding quartz precision is not needed, because of the not well defined slippage of the Belt. 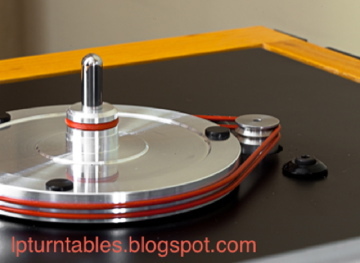 And who needs a high precision Rotation Speed of 33 2/3 RPM? My PSU consists of a precision sine wave Generator (IC) that is adjustable by external resistances. The sine wave is then amplified by a high voltage opamp and darlington Transistors at the Output. The PSU is operated at about plus/minus 40 volts, so an Output of 24volts AC is possible. The supply of the sine wave Generator is stabilised to plus/minus 9 volts. The resistors for the fine pitch are chosen so that the Speed can be adjusted to plus/minus 0.4%. So my TT PSU works fine. The harmonic distortion of the sine Output is less than 0.3%, it consists of a simple Switch for 33/45 RPM and it is adjustable for both Rotation Speeds. Thanks Dieter for sharing the info and pictures with us! For most of the manual budget turntables from Rega or Pro-ject, the speed selection is done manually - just switch the belt from the 33.3rpm pulley slot to 45rpm slot or vice versa. Very simple and of course, cost effective also (without incurring extra cost of a TTPSU). But is this the most ideal way? In the first place, if the belt tension is optimized for 33.3 rpm slot, the tension would be a bit higher for 45 rpm; conversely if it is optimized for 45 rpm slot, then it would be slightly lower for 33.3 rpm. Moreover, the belt also tends to get stretched over time. The interesting question here is : how to adjust this small variation in belt tension? 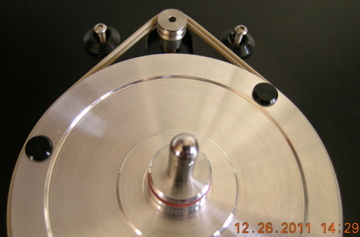 For Rega P5 the motor is bolt-mounted through slots. So it's possible to adjust the motor/pulley assembly slightly forward or backward to optimize the belt tension. 1. 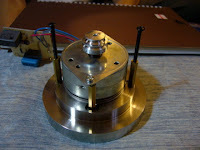 Bolt-mounted the motor ( like P5) to the plinth with suitable insulator and washers. Mark the positions of the motor mounting holes before removing it from the sticky pad. Drill two holes(one with a slotted hole) on the plinth for the motor mounting bolts. Mount the motor. Now the motor/pulley could be moved forward or backward to optimize the belt tension for both 33.3 or 45. 2. Decouple the motor and mount it on an isolation motor base. Since the motor/pulley assembly is not fixed to the plinth, it could be moved forward or backward easily to optimized the belt tension besides solving the "wobbling motor" problem of Planar 2/3 and eliminating motor vibrations from the plinth(for motors mounted with stick pads). 3. 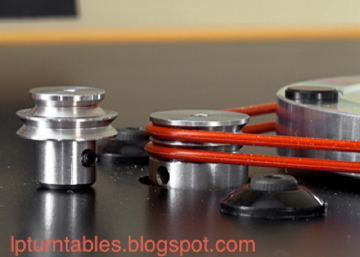 Use a TTPSU and the belt tension is set to a fixed slot for both 33.3 and 45 playback! The next question is which slot is better to park the belt when using TTPSU? 33.3 or 45? For Rega TTPSU, we have no choice as it's set at 33.3. 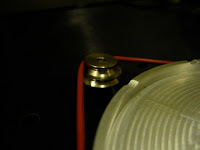 However, personally I would prefer to park the belt at 45 rpm slot.... (if there is a choice). With a TTPSU which requires the TT belt to be parked at 45 rpm slot, the motor actually runs much slower compared to when the belt is parked at 33 rpm slot. This is particularly true for 60Hz region like North America (USA and Canada) where the motor runs at a higher speed of 300rpm compared with EU's 250rpm. By getting the motor to run slower, the corresponding motor noise and vibration would be lowered too (logical?). This could be significant to TT needle which is sensitive to micro-vibrations. Based on the above, do you think parking the belt at 45 rpm slot(with the tension properly adjusted) would be a better option for turntables in general, considering motor noise/vibration is the greatest "enemy" to our turntables? 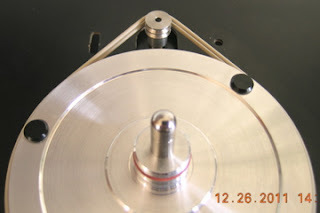 Motor isolation base upgrade has been an intriguing project for many Rega TT tweakers. 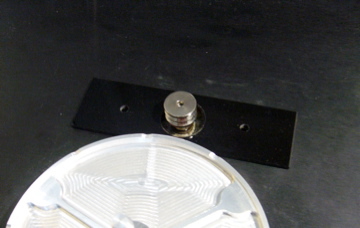 This mod is important as it isolates the motor and thus vibration from the motor to the plinth. 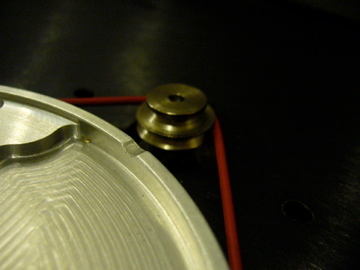 In fact even in tweaking other TT's like Thorens or Pro-ject, I would also begin with this fundamental but critical part of the turntables. ...... After experimenting a bit more with the motor base, first by having the motor contact the plinth and then ensuring that it does not contact it - I verified that the base absolutely provides an audible, positive effect by completely removing the already minimized vibrations in the P5 motor from entering the plinth and the tonearm, and thus prevents the motor from negatively affecting the sound. This is most noticeable in image solidity and increased smoothness - Highly recommend! For Rega P5, P25, Planar 2 and Planar 3, I am adding a piece of plastic bracket for mounting the motor this way (it's reversible). Remember to remove the screws to decouple the motor before spinning! 1. Align the brass props of motor base with the motor mounting holes on the plinth. 2. 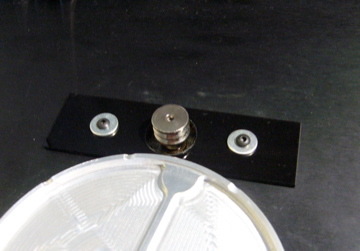 Align the screw mounting holes and pulley hole of the black plastic bracket provided with the holes on the plinth. 3. Use 20 mm or 30 mm M3 bolts and washers, going through the plastic bracket and screw onto the props, securing the motor base/motor/pulley assembly to the board for transport purposes. However, you would need to remove the bracket/bolts when playing. 4. The bracket may be permanently fixed to the top of the board with very thin 3M acrylic tape if you wish. 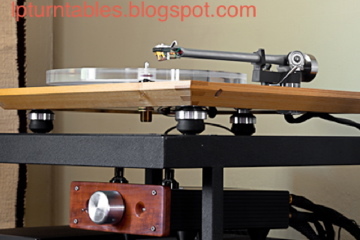 Enjoy life with LP's and Turntables designed and coded by EZwpthemes | Bloggerized by FalconHive.